Porec Croatia is a small town on the west coast of Istria. The town has a long history dating back to Roman times. The old town still has a typical roman street layout; it's mostly symmetrical, with two main intersecting streets – Decumanus Maximus (stretching from east to west), and Cardo Maximus (stretching from north to south). Town's Episcopal Complex of the Basilica is Unesco World heritage site and its oldest parts date back to 4th century, although the basilica itself is from the 6th century. Venetian-style houses dominate the old town. Porec is very touristy. In my opinion, as a tourist destination, it has the most balanced tourist offer in all Istria. It is primarily a family destination. But its nightlife offer is enough exciting to satisfy younger crowd and party goers as well. There are lots of accommodations to choose from (hotels, apartments, campsites), good bars and exciting nightlife, wide range of sport and water activities, historical sites, and other attractions. It's also one of the best organised with ample parking lots, nice traffic flow (even when it's congested), and one of the cleanest towns in Istria (although they are all pretty clean). Porec Croatia is located on the west coast of Istria, 30 km north of Rovinj and 20 km south of Novigrad. Trieste in Italy in 70 km northwest of Porec. Below you’ll find a map of Porec Croatia. You can click on the icon and read our posts about Porec landmarks, things to do, restaurants, hotels, etc. Summer is the best time to visit the town. Yes, it is busy and there are crowds everywhere, but if you want to experience the best of Porec, you'll have to bear with it. If you really cannot stand hustle and bustle of a summer tourist resort, just avoid first three weeks of August. For the rest, you should be fine. Porec is rich in history and culture. The town's main sight, the Episcopal Complex of Euphrasian Basilica, is the UNESCO World Heritage Site. Other top sights include roman temples, medieval town walls and fortresses, gothic, baroque and romanesque palaces. Porec has the best choice of accommodation in all Istria. Two large Croatian hotel chains, Valamar and Laguna Porec, operate majority of large hotels, resorts and campsites in Porec. Besides, there is a variety of apartment and villa rentals to choose from, and a couple of youth hostels located right downtown. Porec is perfectly located to explore the entire peninsula. You can visit all Istrian top sights within an hour drive from Porec. Porec really offers a good value for money when it comes to your holidays. 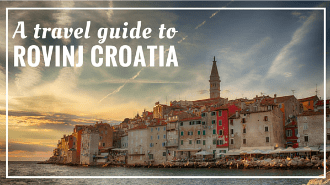 While it's not the cheapest place to stay in Istria (check Rabac, Vrsar & Novigrad for cheaper stays), it has a lot to offer for your money: a variety of activities, historical sights, a choice of restaurants, great bars, cafes, and night clubs. Porec hotels offer buffet breakfast and dinner included in the room rate. This fact alone can make you save lots of money. From north to south, Porec has over 10 km of coastline. Beaches here range from rocky, cemented, pebble to (even!) sandy. Plenty choice for everybody. Sun and sea is still the number one reason to visit Porec. Porec, along with Novigrad, is the best cycling destination in all Istria. Porec has over 250 km of marked cycling trails, of various lenght and difficulty level; it also has bike-friendly accommodation. Porec offers a variety of things to do while on holidays here: from various water, and motor sports, to cycling, and olive oil and wine tasting. We've already written an entire post on things to do in Porec Croatia, but below we give you a short overview of a couple of them. Old town Porec is located on a small peninsula. It's small, and it takes up to two hours to visit all sights. The Episcopal complex of Euphrasian Basilica is UNESCO World Heritage site and Porec's most popular landmark. Other interesting sites include: remains of Roman temples, various gothic, baroque, and renaissance palaces, fortification walls and towers. Basking in the sun, and swimming are still activities number one in Porec. Between Cervar Porat to the north, and Zelena Laguna to the south, you have a variety of beaches to choose from: from wild beaches of Porto Bussola, to fun-filled beaches of Pical, Brulo and Zelena Laguna. Here is our full post on Porec beaches. Motodrom Porec, located a half-way between Porec and Tar, is a great high-octane adventure sports center. You can have fun with go-kart, cross-cart, quads, off-road Segway ride, paintball, rope park, and more. You can read our full post on Motodrom in Porec. Istrian olive oil is of a excellent quality and absolutely yummy. Our fav olive oil producer is Chiavalon from Vodnjan. In Porec, you can visit Agrolaguna tasting room, to learn more about olive oil, and taste Agrolaguna's olive oils. Aquacolors, the first water park in Porec Croatia, opened in May 2015. It quickly attracted the crowds, and became one of Porec most fun activities. Here is our full post about the water park Aquacolors Porec. There are two boat lines connecting Porec with Venice from May through September: Venezialines and Prince of Venice. Venezialines operates more like a typical passenger line where you choose a one-way or return ticket, the same day, or few days apart. On the other hand the Prince of Venice offers round trips only with departure from Porec at 7.30 am and departure back from Venice at 5 pm. This gives you enough time to explore Venice. And it also offers a convenience of not worrying about parking. Euphrasian Basilica is Porec's most popular landmark, and a UNESCO World Heritage site. The complex dates back to 4th century; while the basilica itself us from the 6th century. The complex consists of a church, memorial chapel, atrium, baptistery, and an episcopal palace. A must-visit sight in Porec. The Round Tower is one of three remaining towers from the medieval times. The tower had an important defensive role back in middle ages, but today it houses a cozy bar with a nice terrace at the top. Porec was once surrounded by defensive walls. While the south side of the peninsula serves as a port for fishing and tourist boats, with medieval and modern time buildings lined at the seafront, at the north side of peninsula you can see the town walls, and remains of the North tower. Read our full post on Porec Croatia top sights. In Porec, you'll find a variety of restaurants. Majority of them are very similar in offer: grilled meat and fish, pastas and risottos, seafood like mussels na buzaru or fried calamari. Many of those restaurants offer tourist menus consisting of main, side, and a dessert for 10€ per person. While you'll get your money worth with a meal like this, it won't make for a memorable experience. If you are looking for a budget option, we recommend a pizzeria Nono, Pisinium, or Arman Grill. Nono makes yummy thin-crust pizzas in a wood-burning oven. A price of a pizza starts from 45 kn. Pisinium, located at Porec green market, offers cheap, and homemade cooked meal a day (marenda) for 30-50 kn. And Arman Grill, also at the Porec green market, is extension outlet of famed butcher (also at the market), offering cevapcici, and other local meat delicacies. Mlinar and Concentino are the best bakeries in town. They also make sandwiches, various pastries, and cakes. Our favorite restaurants in Porec Croatia are San Nicola, Daniela in Veleniki, and Hrast. Read our full post on Porec restaurants. Porec really has lots of accommodation options. Valamar and Laguna are two main hotel companies in Porec, operating majority of hotels, resorts, and campsites. Hotels, resorts and campsites are concentrated in few Porec neighbourhoods. Along seafront, in Porec old town, you'll find Valamar Riviera Hotel & Residence, and two small, independent hotels – hotel Mauro, and Grand Hotel Palazzo. On a small St. Nicolas Island, just 5-minute boat ride from the center, you can stay at the Valamar Isabella Resort. Pical, Spadici and Materada are Porec northern neighbourhoods offer mostly three-star properties like hotel Pical, All-inclusive Valamar hotel Pinia, hotel Materada, and newly refurbished Laguna Park Hotel. South of the old town, and only 15-minute walk away, you'll find Brulo neighbourhood with two four-star hotels, Valamar hotel Diamant and Valamar Crystal Hotel, and three three-star properties: Valamar hotel Rubin, Valamar Diamant Residence, and Laguna Mediteran. Plava and Zelena Laguna resorts are further south. Here you'll find a variety of hotels, and apartment complexes, as well as two large campsites – Zelena Laguna and Bijela Uvala. Many people offer holiday rentals in and around Porec Croatia. If you are looking for a good apartment to rent in Porec, our friend Goran rents nice apartments in Porec – Urban Premium Apartments located in a quiet neighbourhood, not far from the hospital. Or consider staying in our villa to rent located in a small village just outside of Porec. Regardless of where you stay, you'll need to use your car daily. Best beaches are in Zelena Laguna, a resort located 5 km south of downtown. Accommodation in downtown Porec can be noisy (from all bars, and restaurants). Accommodation in downtown Porec is more expensive than accommodation in neighboring villages. Do your research before making a booking. Read our full article on accommodation in Porec. Porec Riviera spreads from Cervar to the north to Zelena Laguna to the south, and it offers many beaches to choose from. We personally like the best beaches of Zelena Laguna. Porto Bussola is a wild beach frequented mostly by locals. It stretches from the campsite Ulika to a town of Cervar. Just north of Porec, Pical beach is a popular beach among both, tourists and locals. The beach is mostly rocky with cemented sunbathing decks. The beach is bordered with a thick pine forest, and it's shaded. At the beach there are lots of water and sport activities, children playgrounds and sand pits, deck chairs and parasols rentals, changing cabins, toilets, showers, and a couple of bars and restaurants. Delfin Beach is in Zelena Laguna resort, just below hotel Delfin. This is our favorite beach in Porec, and you can find us here every day during the summer. Read our full post on Porec beaches. Porec, just like the rest of Croatia, has a very strong coffee culture. Locals love hanging out in the bars, meeting friends, people watching, and even business meetings often take place in cafes and bars. There are lots of cafes, and bars in Porec; and dozens of them are really popular among locals and tourists. Along the seafront you'll find Habitat, a daily cafe serving yummy juices and shakes; the Saint & Sinner, a night bar popular among young crowd; the Epoca, a chill-out cocktail and wine bar; and Cafe Del Mar, a cafe serving also cakes and ice cream. At the Marafor Square, you can hang out at the Old Time, one of the oldest bars in Porec, or Comitium, a small cocktail bar with a large outdoor terrace. Just out of the town walls, north of the main square, you'll find the Corner-LeMat, a cozy little bar with live music and stand-up comedy shows. Other popular bars include Tequila at the Pical beach, Villa Club at the town beach, and Byblos, a night club located in Zelena Laguna Resort. If you would like to know more about Porec bars, clubs and nightlife, read our full post. The town of Porec organizes a variety of events, from sport events like cycling competitions, and swimming marathon, to food and wine festivals, and cultural events like Jazz in Lapidarij or Giostra. These events mostly take place from May to October. This festival saw its first edition in 2016, and it's here to stay. The program includes dance, music, theatre, and street performances at various open air venues across the town, day and night, from June through September. There are also many shows for kids. On various nights you can also enjoy cinema under the stars at little park near DM store. Free admission to many shows. See full program here. The best Istrian wine fest, Vinistra takes place in Zatika, Porec sport hall, for the last 22 years. This is the best place to taste local wines, and get to know Istrian wine makers. The admission fee is 80 kn per person per day; and it includes as many wine tastings as you can take. This festival takes place in the atrium of Euphrasian basilica since 1962. The festival includes a series of classic music concerts from June through August. Admission fee depends on concert, but it's generally around 50 kn. A series of jazz concerts take place in the Lapidarium od Porec Heritage Museum every Wednesday throughout the summer. Admission is free. A baroque festival, Giostra, takes place in the streets and squares of the old town. It includes costumed plays and dances. Find out all major events taking place in Porec throughout the year. Porec can be reached by bus, plane, car, and even by boat. Pula Airport is the closest airport to Porec. It's a small and seasonal airport, with a couple of low-cost airlines (Germanwings, Jet2, Norwegian, Ryanair, Vueling) connecting Pula with dozen of European cities. You can fly into Pula airport from Berlin, Frankfurt, Hamburg, Koeln, Bruxelles, Oslo, Stockholm, Helsinki, Rome, London, Leeds, Manchester. Most of flights operate from May to October. Other airports that you can consider when planing to visit Istria are Trieste, Krk, Zagreb, Ljubljana, Venice, and Treviso. Pula Airport is 50 km away from Porec. Shuttle service is operated by Brioni – Fils company. A one-way ticket costs 150 kn (extremely expensive). Consider taking a shuttle from Pula Airport to Pula main bus station (30 kn); and then catch a regular bus line to Porec (additional 60 kn). Autotrans has a good online booking where you can also check bus schedules. Travelling by car is by far the most convenient way to reach Istria. Roads in Istria are excellent. The highway, called also Istrian Ypsilon (it's shaped as a letter Y) is a modern and fast road, connecting Istria with a Slovenian border, and also with Rijeka to the southeast. From Slovenia to Pula, and to Pazin, this is a double lane road; but from Pazin to Rijeka (Ucka) it's a single-lane road. Road tolls apply on Istrian Ypsilon. It's easy to reach Istria by bus, from Pula, Zagreb, Rijeka, and Trieste. Buses depart throughout the day, and more frequently during the summer. A one-way bus ticket from Pula to Porec costs 60 kn; from Zagreb to Porec costs 150 kn per person; from Rijeka to Porec 90 kn; and 70 kn from Trieste to Porec Croatia. Porec bus station is located at the center of town, just 100 m away from the old town. Venezia lines operates a hydroboat between Venice and Porec, from end of April until the begining of October. Starting in May, the boat departs three times a week, and in July and August, daily except on Wednsday. A one-way ticket costs 85 € per person. More info at Venezia Lines website. Porec is small, and easy to get around on foot as long as you stay within town limits. A tourist train connects the center of Porec with Brulo, Plava and Zelena Laguna Resorts, and also to Pical, and Spadici. A one-way ticket costs 10 to 20 kn depending on your destination. Resorts north of Porec (Zelena & Plava Laguna, and Brulo) also have a regular boat line to the center of Porec. A one-way ticket costs 20 kn per person. You can also use taxi boats to move between resorts, and the center. Zelena & Plava Laguna are also connected with the center by bus. A one-way ticket costs 15 kn. When renting car online, we always use Rentalcars.com. They are consolidators, and offer by far the largest choice of cars to rent in Croatia. Their prices are also competitive. However, if you prefer to rent a car directly through a local company, below we listed contacts for local car rental companies. A large international car rental company, also has a branch office in Porec. Parking in Porec is generally easy to find. However, it also costs money. The most convenient place to park is Veliki Parking (The Big Parking as locals call it). This parking is next to the towns green market. Parking fee is 8 kn/ hour, or 50 kn /day. The same fees apply for Karla Hugues parking, just across the street from the bus station; The parking at the bus station costs 7 kn/h, but it is a small parking. Parking Vrtovi is just across the street from the Big parking, but it's a green space used for parking when needed. Fees are 6 kn/ hour, or 50 kn/ day. Parking Zatika is located at the entrance of town, near the sport hall Zatika, and town's cemetery. This parking is large, and it disposes of parking spots for cars, buses, and camping vans. It's a bit further out of the old town (10 minutes walk), and it's the cheapest parking in Porec. Parking fee is 4 kn/ hour, or 30 kn/ day. Camping vans can park there for 24 kn/ hour, or 120 kn/ day. Parking is also available on the designated areas on the streets. Street parking is grouped in three zones, zone I and II are closer to the town, parking is limited to 2 hours at once, a parking fee is 8 kn/ hour in zone I, and 6 kn per hour in zone II. It costs 4 kn/hour to park in zone III. From June, 1 to September, 30 parking fees for street parking apply from Mon-Sun from 7 am to 10pm. The rest of a year, parking fees apply Mon-Fri: 7 am-7pm; Sat: 7 am-2 pm; free on Sundays and holidays. A grocery shopping in Porec is easy, and you've got a vast choice of supermarkets to choose from. Almost all supermarkets in Porec are located along Mate Vlasica Street, and each has a large parking lot. You'll find here two Croatian-owned supermarket chains Konzum, and Plodine, as well as large European chains – Lidl and Kaufland. Billa is the only supermarket located downtown, just next to the bus station. Lidl is by far the most efficient supermarket when it comes to queues. It's also a bit cheaper than others. We do our groceries in Konzum most of the time, and mostly out of habit. We also like to check Lidl for the international products, as Lidl regularly has products promotion by country like French, Spanish, or American week. Best butcher in town is Arman with a store at the covered part of the green market. And the best fish stores are Ancora at Gaspara Kalcica 10, and Batana at P. Kandlera 13. Both offer to clean the fish you buy, and also to grill it or fry it for you should you wish. There are three pharmacies in Porec. One is located on the main square, another one just a couple of meters away in Pietro Kandler Street, and the third one next to the hospital. Pharmacies work long hours Mon-Sat, and on Sunday and holidays one keeps open (they rotate for Sunday shift). There are three drugstores in Porec – Bipa, DM, and Mueller. All are located in downtown. Our favourite is Mueller. Two stores sell camping and outdoor gear – Parens at the main entrance to Porec, and Meridijen in Porec Industrial Zone. Clothing stores are mostly small boutiques located in Porec old town. Among others you can find Sisley, Benetton, and St. Oliver, but no high-end brands. Croatian currency is Kuna, although some things you can pay in Euro, like meals in restaurants, accommodation, pay tolls, and gas. The exchange rate is around 7,6 kn for 1 euro. You can exchange money at many places in Porec: exchange offices, banks, hotel receptions. I always hear people complain that internet in Croatia is slow. I generally don't need super fast internet, 4 mbps is fast enough for me. The problem is that not many places in Croatia get a decent and stable connection. Where we live we can't even have a fix internet, instead we use mobile internet router. And the signal isn't always strong. However the closer you stay to downtown, the better internet you should get. Almost all accommodation come with free WiFi internet, and you should expect speed of at least 2 to 4 mbps. Mobile mostly runs on 3G, and just rarely on 4G. Many bars and restaurants offer a free WiFi for their guests, but you need to ask for a pass. Town also offers a free WiFi hot spots, but this connection unfortunately doesn't work most of the time. Wow thank you for all the information. I am a Croatian living in Canada. In a year, I will be getting married in Porec, Croatia. My husband to be is also Croatian. We are creating our wedding website and I was wondering if I could kindly steal some of your information 🙂 I have been going since I was a little girl but none of my friends have ever been. We will be getting married at Villa Polesina. Good afternoon I am trying to find a good travel guide to Porec as my husband and I are coming to Porec in June for 10 days, I found your web site and your guide seems to be excellent but can we purchase this in book form? as it would be so much easier to carry around! I would very much appreciate your response. Lots of lovely ideas and things to remember. We are coming as a family of 5 staying at the Valamer Rubin at may bank holiday. With a varied age of children 2,9 and 13 we didn’t want a beach holiday the eldest wanted to see things! We like the idea of going over to Venice but also want to go to Pula. The children also love a boat ride. We have breakfast but we like going out and experiencing local food. What are the kind of costs for eating out? Are there better places than other to go on excursions? Excellent web site full of very useful information especially about car hire and getting around in fact its all good so well done to you both for sharing all this info we us. I have booked a 10 day holiday through Ryan air with car hire included,their’s was cheaper than Rentacar came up with. We are staying at the Laguna Materada in middle of May, I had booked the hol before seeing your web site. As they charge £97 to cancel have left as is. You’ll be ok at Materada. The hotel was renovated three, or four years ago. And the gardens around are nice. Hope you’ll enjoy Porec! Frank can i use my disabled badge if i fetch it with me when parking anywhere.We are staying for 10 days in Porec but intend to gad about in car . there are lots of designated disabled parking spots in Porec at every parking. You should be ok using your badge. Here we have a sticker on the car, but I believe it will work with a badge too. We are a group of 12 people from India. We are planning a holiday in Croatia in last week of May 2017 for about 8 days.. We will stay in Porec and make daily visits to nearby locations by hired bus. Can you help us in locating a suitable hotel, a hired bus etc. We will need a guide also. We are staying in Porec in June. We don’t drive but like to get out and about, walking and visiting other towns etc. as we like to get a proper fell to the country we are visiting if possible. What is the bus service like for getting to other towns in Istria please? I would like to visit Rovinj, Pula, Novigrad as well as inland towns. We also hope to do excursions to Venice (by boat) and Trieste. From what I’ve read so far on this (excellent) website there seems to be plenty of opportunity for walking. would have been nice our Hotel:” HOTEL POREC”also to be recomended as a small independent, private Hotel in front of the marina-harbour ( in between Bus station and Billa) … Since 1997 we are private and open all year round. Vera Dugandzic and the HOTEL POREC team.